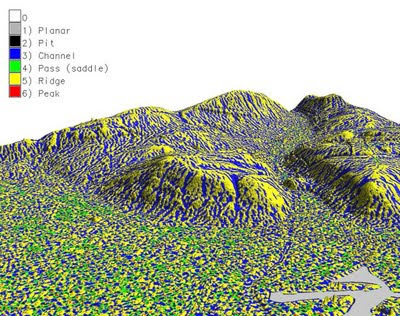 Paul Shapley's Open Source GIS Blog: Geomorphology anyone? "The scientific study of landforms and the processes that shape them". That's the Wikipedia explanation of what must be a fascinating subject. Like a lot of Open Source GISers I have an unnatural curiosity about phenomena acting on the earths surface and how we can model the changes it creates. I'm a huge fan of QGIS too but today the new version (1.7.0) just crashed on me for the second time so in frustration i fired up GRASS GIS to try and investigate more about the landform character of Neath and Port Talbot in South Wales, UK (the area in which I work, itself full of steep but small mountains). I've always been interested in obtaining more information from a DEM and the GRASS GIS Module 'r.param.scale' has become the focus of some experimentation for me, Why? how sad you may say... perhaps not many people outside the British Society for Geomorphology would ever come across the phrase. Essentially, it is about the 'characterisation' of the landscape. I've just read a few chapters of Jo Wood's PhD Thesis and found it both fascinating and often confusing read for the layman like myself. Morphometric characterisation is the subdivision of all points on a surface into six morphometric feature types namely 'Planar', 'Channel', 'Ridge', 'Pass', 'Peak' and 'Pit'. Here is the resulting analysis displayed in NVIZ. Must read more on the subject.